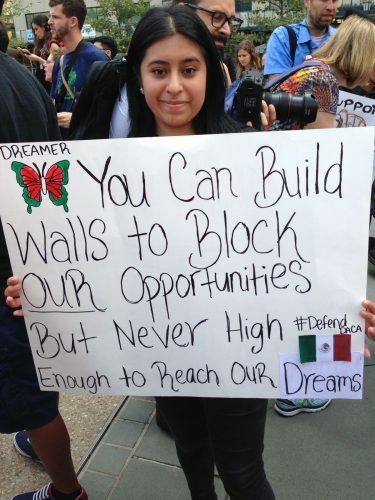 Some call these young undocumented people Dreamers. We know them as visionaries. * Young undocumented people protested for years and risked arrest and deportation, eventually winning DACA in 2012. They won protections from deportation for 800,000 youth that Trump and Sessions just took away. But their visionary movement goes beyond DACA – it’s about fighting for all 11 million undocumented immigrants. That’s why as Trump and Pelosi discuss deals over dinner to bring back DACA at the cost of more enforcement and border militarization — we must fight against walls in any form. Can you support immigrants in Alameda County this weekend and next? We have to keep fighting for the vision that courageous young immigrants** dream of — a place where all immigrant youth and their parents and loved ones are welcome. We support Dreamers, and we need to fight for their freedom dreams. Check out and share our list of resources for DACA recipients and six ways to support as allies. There are free clinics for DACA renewal and financial assistance starting today and ways to volunteer starting this Saturday. Find out more at our full list of resources and ways to support. Stay tuned for upcoming actions.